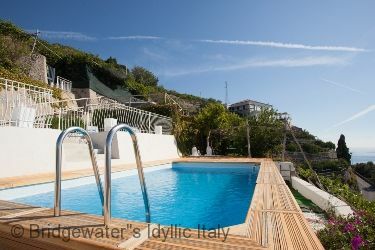 Villa Maiori is situated in an elevated position on the side of the Amalfi Coast hills, just a short drive from the town centre and the lovely beach of Maiori which is well known amongst Italians and with possibly the nicest and largest beach of the area. The town, fairly large compared to the other villages on the coast, offers good restaurants, shops and a port where you can take a boat to Amalfi, Positano, Capri etc. 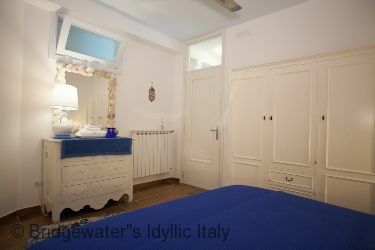 It's the ideal location for those who want to explore the Amalfi coast whilst staying in a more authentically Italian town. At Villa Maiori a car is not necessary. However, if you have a car, the villa features 2 private parking spaces. The main features of the villa are the large L-shaped garden and the different sized terraces located on different levels. 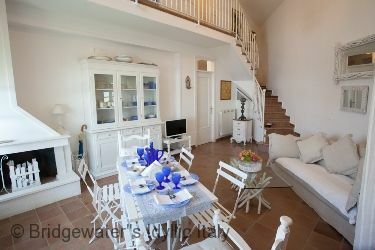 The terraces are linked to each other by stairs and are tastefully furnished with high quality outside furniture. 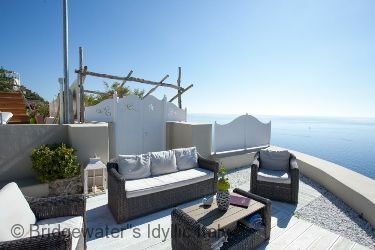 From each of the terraces you will enjoy stunning views - virtually a 180 degree view of the sea and mountains - and experience wonderful sunsets. In front of you, at a short distance, you will sea a cape overlooked by an ancient watch tower called "Torre Normanna" which is now a famous restaurant. 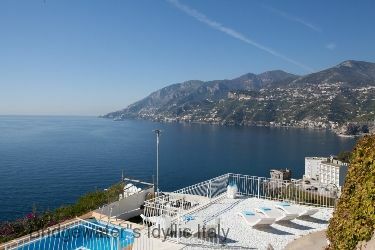 Slightly further off you will see the magnificent coastline where Amalfi, Ravello and other small villages lie, all the way to the Cape of Conca dei Marini. 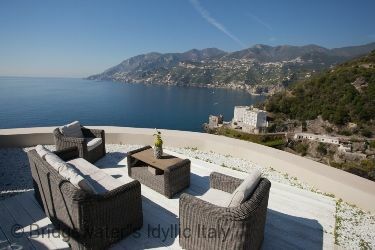 An authentic “Belvedere terrace”, a relaxing outdoor living area, is set at the border of the property. The views from the belvedere are impressive, especially at night when the moon shines off the glittering Mediterranean sea. 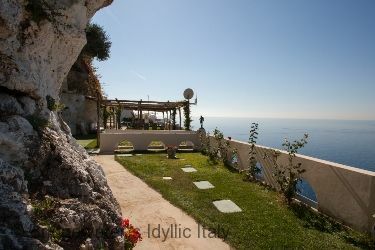 Inside the villa is completely built into the rock and spreads over two levels, with modern décor throughout. 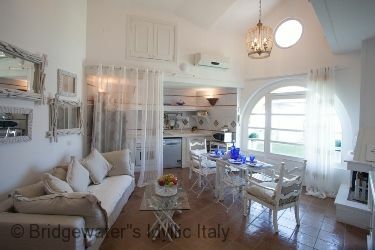 The care of furniture, terraces and gardens make Villa Maiori a unique magic and peaceful place for your holiday. The total area of the villa is 80 sqm indoors and about 650 sqm metres of outdoor areas, consisting of terraces and gardens with beautiful views. 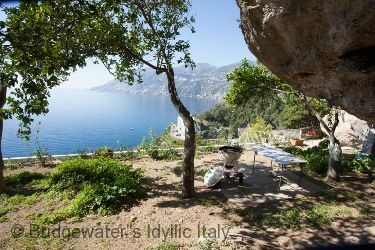 The main gate allows you to enter the garden with a barbecue area to one side, which is completely carved into the rock. This surprisingly large garden, adorned with a variety of flowering plants, herbs and colourful roses, is bordered by a wall decorated with arches. Along the alleyway is the laundry area with a washing machine, iron and ironing board. The main terrace is partly shaded by a characteristic pergola with a bamboo roof and partly covered with an electric awning. This outdoor dining area is equipped with a ceramic dining table for 8 people as well as a comfortable seating area with long masonry benches. 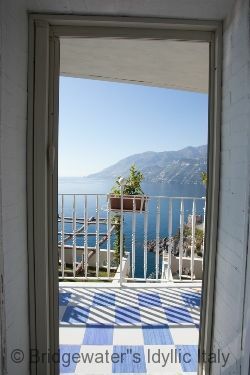 At the border of the terrace a white gate takes us to a relaxing corner named “The Belvedere Terrace”. 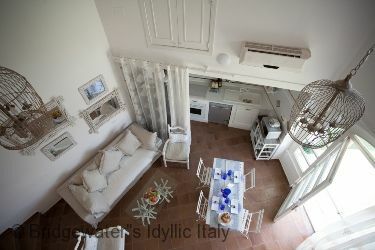 This terrace hosts a living area furnished with wicker armchairs and sofa sitting 6 people around a low coffee table and 2 sun loungers. 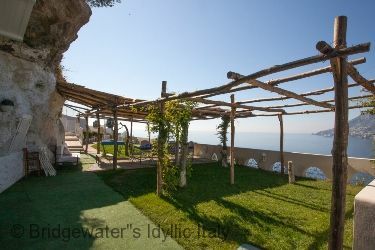 Back to the main terrace, 12 steps up links to the solarium paved with white pebbles and equipped with 6 modern deck chairs and an external shower. 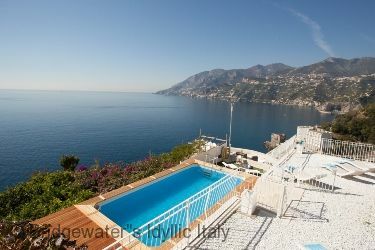 From the solarium, you may access the private outdoor pool (6.5m x 3.5m x 1.30m) located 7 steps below and the Jacuzzi terrace reachable by climbing 12 more steps. The outdoor Jacuzzi is suitable for 6 people, can be heated, and also features a radio system. 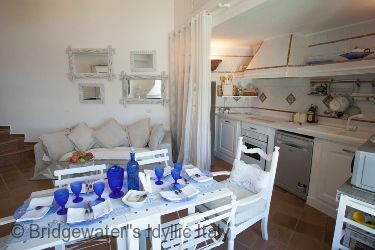 From the garden, you enter directly into the open living/ dining room with a kitchen corner. The elegant living room is equipped with sofa and armchairs sitting 6 people around a glass coffee table, a white cupboard, a folding table and a romantic fireplace. The kitchen corner is equipped with a full size fridge with freezer, an electric oven, 4 induction hobs, a microwave oven, a dishwasher, an American-style coffee-maker and other small appliances. 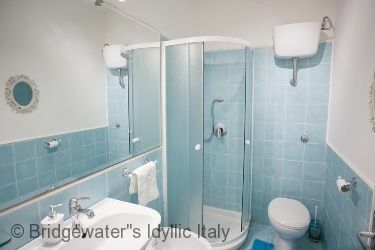 On this level are located two bedrooms sharing a bathroom with shower, a washbasin, a toilet and a bidet. One bedroom has a window opening onto the main terrace and an air conditioning/heating unit, the second bedroom is on the back of the house (no views) and has a ceiling fan. 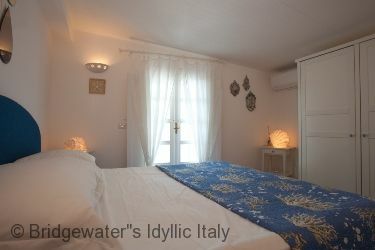 Both bedrooms are equipped with a matrimonial bed (180x160). The second floor is reachable by climbing 16 stone steps. 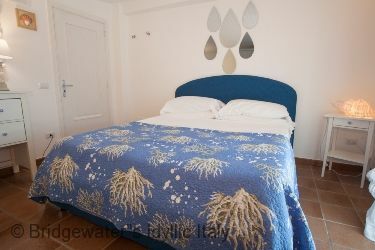 Here you will find another double bedroom with en suite bathroom. 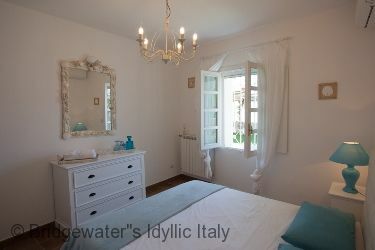 The bedroom features a French door opening onto a small balcony with sea view and is equipped with air conditioning/heating unit and a matrimonial bed (180x160). 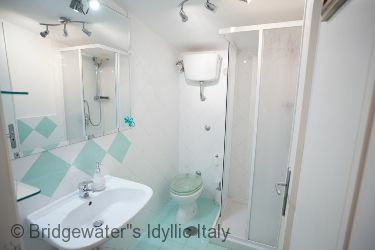 The en-suite bathroom with green majolica tiles is equipped with a washbasin, a toilet, a bidet and a shower. 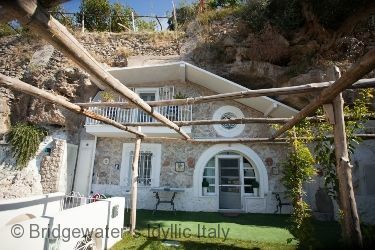 Access: The Villa is situated along the main coastal road that links all the villages of the Amalfi Coast, an excellent location for exploring the Amalfi coast. From the road, a short driveway (about 50mt) takes us to the parking of the villa which is shared with another property belonging to the owner’s family. Private parking spaces for 2 mid sized cars or for 1 minivan are reserved to guests of Villa Maiori (be aware that if you rent a car, the smaller the better since the road along the coast is winding and narrow). 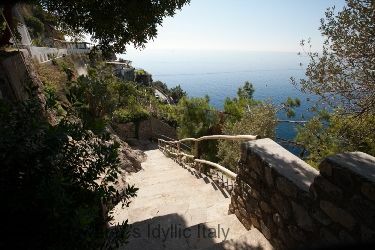 You will reach Villa Maiori from the parking area along a private walkway that is cut into the rocky cliff and includes approximately 85 stairway steps. Facilities: Pool (4 x 7 x 1.30) opens from May 05 - October 13, air conditioning in two bedrooms and central heating, washing machine, dishwasher, Satellite TV, DVD player, WI-FI Internet access, 4 induction hobs, electric oven, refrigerator with freezer, microwave, toaster, kettle ,barbecue, American coffee-maker, ironing facilities, hair dryers, mosquito screens in all rooms. 200 payable locally, per week, for mid-week cleaning with change of linen and towels and end of week/final cleaning. Refundable security deposit due upon arrival:: € 800 euros in cash. Maid service: Extra maid service is available locally upon request and payable locally; approximately 15 Euros per hour. Services upon request by prior arrangement: (supplied and payable locally) food delivery (€ 30,00) Cook service (min € 250 for a chef and waiter), extra linen (€30 per room), crib (€50 per week), baby sitting (€15 per hour) porter service for luggage (€5 per each piece).